SEATTLE, Nov. 3, 2009 -- Northrop Grumman Corporation (NYSE:NOC) is helping new engineers bridge the gap between the technical foundation they acquired in college and the practical knowledge they need to succeed on the job by co-sponsoring next week's Aerospace Early Career Technical Seminar (Aero-ECTS) , a combination technical symposium and business expo scheduled to run Nov 10-12 at the Washington State Convention Center here. The event for early career engineers from the aerospace industry is a joint session of the American Society of Mechanical Engineers (ASME) and the Society of Automotive Engineers (SAE). It will allow attendees to gain technical, soft-skill and professional development knowledge through interactive and experiential programming. "The SAE advisory board has put together an exciting program for this year's Aero ECTS attendees," said Frank Carus, director of Vehicle Structures for Northrop Grumman Aerospace Systems. "We're confident it will provide engineers with unique insights into what they need to do to compete and be successful in an increasingly demanding global marketplace." According to Carus, visitors to the Northrop Grumman booth in the business expo will also have the opportunity to see and have their picture taken with the company's B-2 Stealth Bike, a custom, bomber-themed motorcycle designed and built by Orange County Choppers. The complimentary photos will be available for download from the company's Facebook page. Technical sessions at Aero- ECTS will feature several Northrop Grumman Aerospace Systems executives: Carus and Chief Engineers' Director Giorgio Accolti-Gil will be featured in a session entitled "What all early career engineers need to know." Frank Flores, vice president for engineering, will lead a roundtable lunch presentation and Q&A session highlighting his career contributions to the field. Michelle Bailey, director of avionics, will share some of her experiences at the "Integrating Systems Engineering into Aerospace" session Nov. 11. A complete schedule for the technical sessions can be found at http://asmeconferences.org/AeroECTS09/program.cfm . Accolti-Gil is also being honored by the SAE with its Forest McFarland award, which recognizes individuals for their contributions to the SAE Engineering Meetings Board. Accolti-Gil has been instrumental in the planning, development and exchange of technical information by the Society. "We're very proud of this recognition of Giorgio's contributions to the engineering profession by the Society of Automotive Engineers," said Flores. "He's inspiring all us to stay involved in the engineering professional societies that allow us to stay abreast of the latest trends in engineering and showcase Northrop Grumman accomplishments." Northrop Grumman, the Air Force's prime contractor for the B-2 stealth bomber, commissioned the B-2 Stealth Bike as part of the company's year-long celebration of the 20th anniversary of the first flight of the B-2. 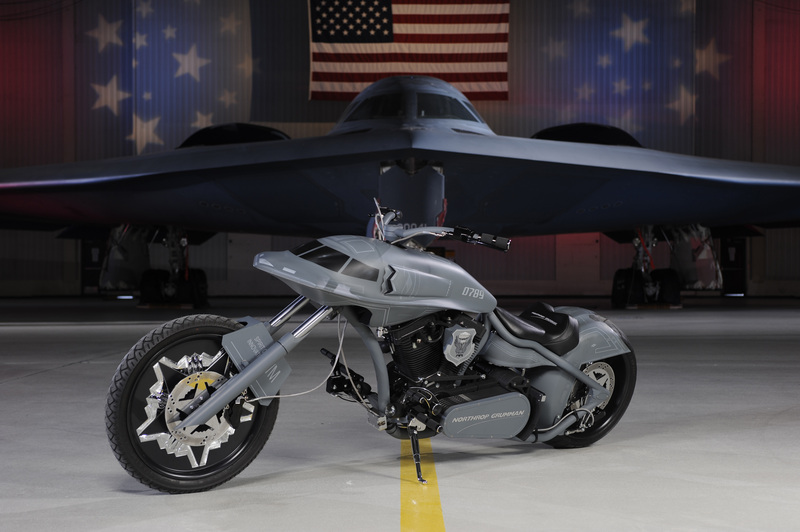 The bike, named "The Spirit of Innovation," honors the enduring partnership between Northrop Grumman and the Air Force that designed and built the B-2; and the brave airmen who fly, support and maintain the fleet of bombers today. It was featured on the 2009 season premiere of cable TV reality series "American Chopper," which airs on TLC. The B-2 Stealth Bike's design mimics many of the visual details of the B-2 stealth bomber. For example, its gas tank and extended front cowling are shaped to resemble the B-2's unique cockpit and fuselage; its "tail number" is 0789 to commemorate the date of first flight (July, 1989); and each side of each wheel contains five machined aluminum B-2 models positioned in the shape of the Air Force star; each model is engraved with the tail number of one of the 20 B-2s in the current fleet.